They'll hear you at the far ends of the field when you use this megaphone. Easy to hold, easy to carry, you’ll be heard up to one mile! The microphone is built into the rear end of the unit and is activated by a trigger on an ergonomic pistol grip. Use this super-powerful, 50 watt megaphone indoors or outdoors. Plus, it’s got USB playback -- just plug in a USB stick with your favorite digital music. Amplify your voice cord-free and with clarity with this lightweight device. Unit includes adjustable volume control and a built-in siren. Requires 8 x C batteries or a 9V DC power supply (both not included). Built with revolutionary Piezo Dynamic Technology, the PMP58U packs a lot of power in a light-weight, easy-to-handle design. It's much lighter than similarly-powered megaphones that use more conventional technology, and it's powerful enough that you can be heard up to a mile! Just insert a USB card and you can entertain and inspire your audience with music and recordings downloaded right off your computer. You can play pre-recorded messages and talk over your music selections. In addition to standard talk mode, the PMP58U features a built-in siren so you can get everyone’s attention fast. The PMP58U is easy to use and even easier to hold thanks to these great features. The Pyle Megaphone PA Speaker System provides portable and high-powered audio projection ability! 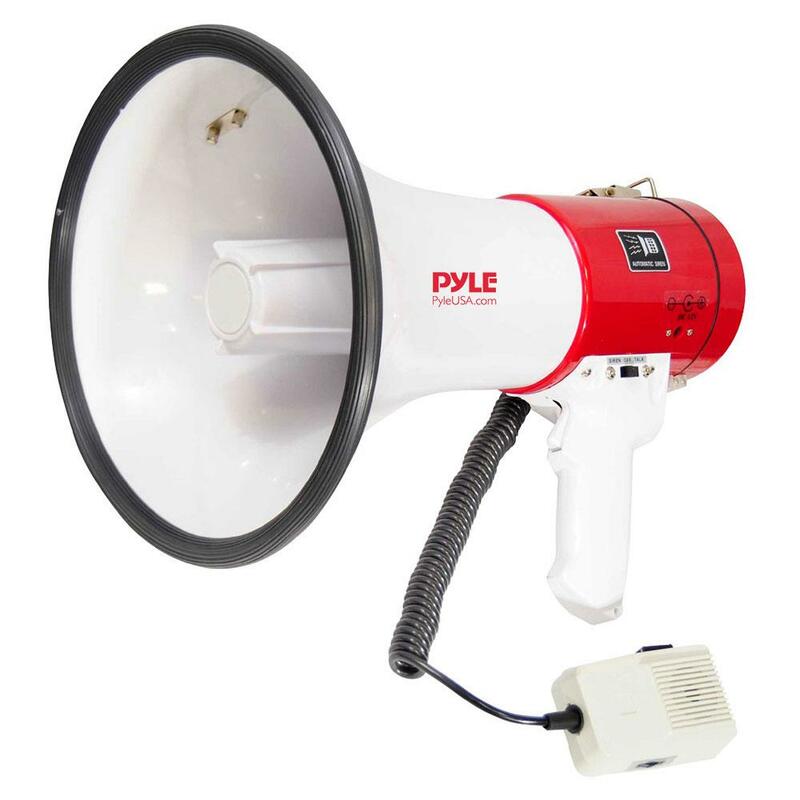 With each iteration of flagship megaphones, Pyle has improved the battery life, sound power and ergonomic functionality -- to ensure your message is heard loud and clear. Control crowds from distances up to 5,200’+ feet away with handheld wireless performance. The system is battery operated, requiring (8) x ‘C’ batteries -- or can be powered by an external adapter via the power input jack. Use the integrated handheld wired microphone to add even more convenient audio projection mobility. Additional system features include switch-activated siren alarm mode that emits a continuous emergency tone, Aux (3.5mm) input jack allowing you to directly connect and stream audio from external devices, along with a USB flash memory reader to playback MP3 digital audio files. Enjoy wireless PA sound power performance with the Pyle Megaphone Speaker System. Review : so far satisfied with purchase delivery and product! Review : This product is excellent for anyone who wants a nice megaphone at a decent price. This cost me about $40 (marked down from list price), and it's of great quality for that amount. It produces a clear and loud voice when you speak through the microphone, and the volume is adjustable. The siren is extremely, and in my opinion unnecessarily, loud. The negative to the siren feature is that the volume control does not mute it, and it automatically goes off when you switch it to siren mode. I will not need the feature for my uses, so I taped a small piece of clear plastic between the switch and the screw beside it to prevent the switch from accidentally going into the siren position. I like the detachable microphone feature. This allows me to wear the megaphone with the shoulder strap (included) and use the small microphone to talk. The detachable microphone has it's own on/off switch. You can also lock the switch into the on position, so that you don't have to hold down the button on the grip while you are speaking. The megaphone itself is not as heavy as I imagined it would be, despite it being so large. It's fairly easy to hold up without much effort, and the grip is comfortable. Myself and the non-profit organization that I direct will get plenty of use out of this product. Review : Nice product overall. Pretty loud and durable. Review : We received our order promptly and tested these megaphones out and they seem to work great! Review : I looked at this item online and decided to put 2 of them on my wish list on amazon.com. I bought my first one, and just got it today. Review : This works very well and is Awesome! Review : Great value and the USB feature is easy to use and an excellent feature. Sorprised by quality and features for the price. Review : I bought the Pyle Pro PMP58U Bull Horn and it is one LOUD And CLEAR Bull Horn. It meets what I expected. Review : Freakin' awesome! I love it, and it has a USB so I can blast out music and sounds....fantastic! Review : Had a lot of fun with the megaphone. My wife dressed up for Halloween as "Sue" from Glee. The megaphone works well and the ability to play music is a great extra-- we added Halloween music to it. Review : This is an excellent product and I look forward to using it often and happily. Review : This product is absolutely excellent. I am able to play music right off my flash drive. The music comes out crisp and clean and is very loud. Review : Great...operates as described!